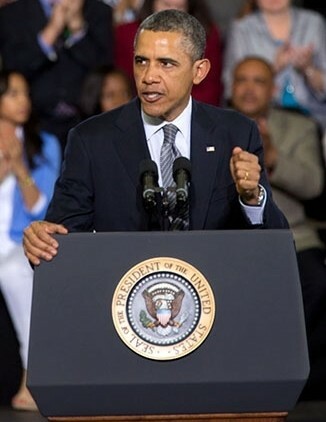 HARTFORD, Connecticut -- President Obama traveled to Connecticut today to make his case with the American people to push forward with an assault weapons ban. "We have to tell Congress it’s time to restore the ban on military-style assault weapons, and a 10-round limit for magazines, to make it harder for a gunman to fire 154 bullets into his victims in less than five minutes," Obama said. Frustrated by a growing list of Republican senators who are promising to filibuster any gun control legislation that comes before the U.S. Senate, Obama called on lawmakers to put a gun control bill to a vote. "Some folks back in Washington are already floating the idea that they may use political stunts to prevent votes on any of these reforms," Obama said. "Think about that. They’re not just saying they’ll vote “no” on ideas that almost all Americans support. They’re saying they’ll do everything they can to even prevent any votes on these provisions. They’re saying your opinion doesn’t matter. And that’s not right." Last month, Senators Marco Rubio (R-FL) and Rand Paul (R-KY) joined Senators Mike Lee (R-UT) and Ted Cruz (R-TX) in a letter to Senate Majority Leader Harry Reid (D-NV) expressing opposition to any legislation with additional restrictions on the Second Amendment rights of law-abiding citizens. The Daily Show with Jon Stewart Pokes Fun At Florida "Stand Your Ground Law"